Speakers are being announced for the European Managed Services Summit in Amsterdam on May 23. Our opening keynote sessions will examine the changing nature and needs of customers. Gartner Research Director Mark Paine will present “Working with customers and their chaotic buying processes”. He will present the Gartner view on how the changed customer buying process has become hard to monitor and follow and can be abruptly fore-shortened. “Who are the real customers anyway?” he will ask, using research into changing buying processes. The working agenda is here, but we have also been talking to some of the speakers about why managed services is so important, both for delivering technology and in bringing new concepts such as blockchain to the smaller customers. Jonathan Simnett (pictured above at last year's Summit), director Hampleton Partners: Big data, cloud, IoT continue to drive consolidation in the market, as larger customers look to use what they offer. Tech services and support need resources and take the view that it is cheaper and easier to buy rather than build, to get them. Increasing demand for limited resources means buyers bidding up prices. Latest research shows this only increasing in the future. SaaS, cloud and digital marketing companies are all in demand from strategic buyers. 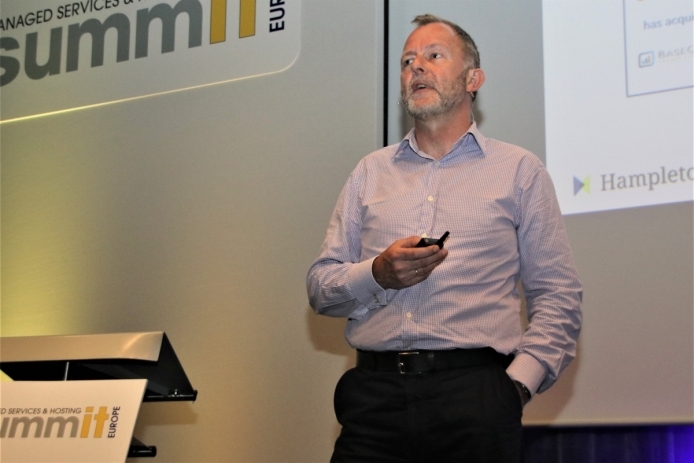 At the European Managed Services Summit in Amsterdam on May 23, Jonathan Simnett will talk about where the smart money is going and how to make your business more valuable. John Garratt, Editor of IT Europa talks to Igor Pejic from BNP Paribas about the rise of blockchain and its application to managed services. Igor is speaking at the European Managed Services Summit in Amsterdam on May 23 on what blockchain means for every industry and what it offers to MSPs.